Maybe that doesn’t sound like a big deal to you, but I have to tell you that between one thing and another, I didn’t nap (excluding illnesses) for almost fourteen years. If you’ve been around here for a while, and you’re the astute type, you may have noticed that is quite nearly the age of my eldest son. This is not a coincidence. I was a napper before children, and my specialty was the power nap. Fifteen or twenty minutes on a couch with a comfortable blanket was all it took to pick me up when I started wilting. When my eldest was almost a year old, we became pregnant for our second son. That little pink line on the pregnancy test spelled doom for my naps for many years. One kid you can make to take a nap. Two kids? Well, all I can say is good luck if you’re bent on getting your little ones to nap without medication. And I was. The point is this… My baby is now six years old and will be turning seven this fall. I’m bringing back the power nap. The now twenty to thirty minute power nap (I’m older and tired-er with five kids) is what’s getting me through canning season and the buckets and bushels and boxes of produce I’m putting up like a little old ant for the winter while my grasshopper kids get in their last day of summer vacation. The nap gets a little assist from recipes like the one I’m sharing today that require almost no special equipment, no canning whatsoever, and so little effort that it almost makes itself. My farmers’ market compatriot and friend, Halle Reed, of Vandermark Farms in Scio, New York provided me with almost a bushel of various bell peppers that couldn’t make it to another market. Almost as valuably, she also told me how she preserved the peppers (and that she already had more than plenty up for the winter.) She said to cut the good pieces away from the core and toss ’em on the grill. She went on to instruct me to stuff them into canning jars, heat olive oil and pour the olive oil over the peppers, then lid and refrigerate them. And to think all this time all I did was sautee and freeze them. Thank you, Halle! You have roasted peppers in the refrigerator to use on a whim. Say hello to roasted red pepper, smoked bleu cheese and garlic stuffed kalamata pizzas, or roasted red pepper pasta, or grilled chicken and roasted bell pepper sandwiches. Hubba hubba. Yes you have peppers, but look at the medium in which those peppers are swimming. See all that beautiful olive oil? That is a pantry staple in itself. Brush the flavoured oil on pizza crusts, on bread for some pretty spectacular garlic bread, use it to sautee vegetables or drizzle a little over a salad. The possibilities are almost limitless. I’m not going to give you exact quantities of peppers and olive oil, because honestly? It all depends. I started with almost a bushel of multi-colour peppers. Some of them had parts that needed to be trimmed away, and my final yield was exactly one half-gallon, jar, one quart jar and one pint jar. It took about four cups of olive oil to submerge the roasted peppers. This will vary, though, so be prepared to have more or less. There are loads of peppers still out there at markets, folks. Go on! Lay your hands on a big old box of them and get a jar of this in your refrigerator. You’ll be so glad you did! Use the bounty of bell peppers available at local farmers' markets -or from your own garden- to prepare a jar or two of delectable fire roasted peppers to add to everything from pizza to pasta to salad to pimiento cheese to sandwiches through the cold months. It's like a jar full of summer. Store in the refrigerator for up to three months or in the freezer for up to a year. Stand a bell pepper on its bottom on your cutting board. Use a sharp knife to cut slabs of pepper away from the seedy stem and core. Discard the cores and set the pepper pieces in a bowl. Repeat until you've prepared all of your peppers this way. Lay the pepper pieces, skin side down, on the heated grill. Grill until the skin is blistered and black, flip the pieces and cook for just 1 minute. Transfer the cooked pieces to a 9-inch x 13-inch rimmed baking dish. Cover gently with plastic wrap or foil and let them cool until they are easy to handle, about 20 minutes. Put a wide-mouthed canning funnel into a large jar, drop the slices of garlic into the jar and set it near your work station on the counter. Slough the blistered, blackened skin off of each pepper slice, then slide the slice into the jar via the funnel. Repeat until you've done all of the pepper slices. Don't cram the peppers in, they will compact themselves sufficiently and you want to leave room for the oil to circulate. Heat some olive oil in a heavy-bottomed saucepan over medium heat until it registers 200°F on an instant read thermometer. Ladle the olive oil into the canning funnel until the peppers are completely submerged. Use a long chopstick or skewer to slide down the sides of the jar to release air bubbles. Add more oil to keep the peppers covered if necessary. Add a new two-piece lid to the jar and let cool for about an hour before sticking into the refrigerator. These peppers will keep for 3 months as long as they are properly refrigerated. For longer storage, transfer the peppers and their oil to a zipper top bag and freeze for up to a year. Note: Close to a bushel of red peppers yielded about 3 quarts of fire roasted peppers. These sound awesome! Love this idea! Just made some last Saturday after a delightful trip to the market. Love them on sandwiches. How come you don’t want us to use extra virgin olive oil? Hi Mary! Good question. 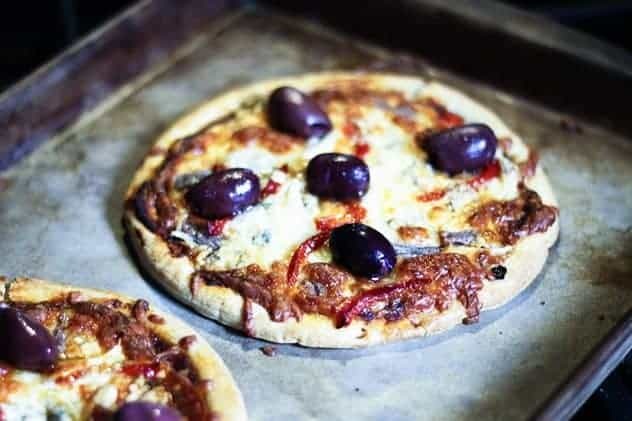 The reason I steer you away from extra virgin olive oil here is because you’re bringing it up to a hot temperature which accelerates the breakdowns of the fats in extra virgin olive oil. The fat in regular old olive oil is a bit more heat stabile and will last longer once poured over the peppers and stashed in the fridge. In other words, heating the extra virgin olive oil to the point we do here starts a clock ticking away on the life of the oil before it goes rancid. I dont know much about canning etc but do you have to do anything special to the jars before you fill them with the peppers i.e. sterilize it and go the full hog like you would if you were properly canning food for long term storage? I think any time you plan on storing something long term, it’s a good idea to sterilize the jar. Better safe than sorry! I have planted several pepper plants in a varity of colors and I’m sure I will have more peppers than I will know what to do with. I would like to make this recipe, but not sure as to what to do with them. I won’t want them to go to waste. I heard they are good on sandwiches. What else could you use them for? Thanks for all that you do. Excellent on BBQ’d Italian Sausage on an Italian bun. Could you can these? I have limited space in my fridge and freezer. Unfortunately, this is not suitable for canning because of the oil and the low acidity of the peppers. You would have to pressure can them which would render them mushy and bland. I just harvested a ton of peppers in the last week and decided to give this a try. The peppers looked great the first couple days in the frig but now the oil has solidified. Is this normal? It’s totally normal! Olive oil is solid at that temperature. When you’re ready to use a couple, you can either fish them out like that or bring the jar to room temp. The more often you do that, though, the faster things may spoil! I used to have the same thing happen to my marinated feta but have found if i mix 1/3 sunflower oil in with the olive oil it keeps it runny but still has that olive oil taste. i presume it would work with this too. Hi Rebecca – I just found your site. My husband and I run a food truck. I would like to make these peppers for one of our wraps that we do as a special every now and then, but looking to put it on our regular menu. I’d rather not roast peppers every single week and thought I could make a large batch like this. I typically add a splash of balsamic to my roasted red peppers that we use on this sandwich. My question is can I still add the balsamic if i plan on keeping them for a month? Also do you recommend storing the papers in a few smaller mason jars rather than one large one if I plan on diving into the jar a little every week? Looks good, but why heat the oil? Looks wonderful and I like another option to preserving these other that freezing.What a great hostess gift also! I roast quite a few peppers at a time by buying a small replacement BBQ grill (for the circular domed BBQ’s we all know. Online, about $7) and placing it on top of my largest gas burner on the stove. Now I have a larger, flat surface to roast several red bell peppers, jalapenos, etc. at once. Just turn with tongs until blackened all over and then I put all of them in a pot with a tight fitting lid and let steam until they are cool. Peeling is a breeze if you use a paper towel to help remove the char. I mean these look great, but I would be hesitant to start making them especially not knowing how much peppers or olive oil the recipe takes. Hi there, Besa. The beauty of this is that you can make it with as many or as few peppers as you have handy. As for olive oil, you just need enough to keep your newly roasted peppers submerged. 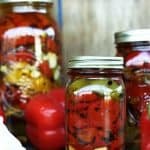 You know it will be less than the size container you’re using, so if you have a pint jar that you’ve filled with fire roasted peppers, you’ll need less than a pint of olive oil. Thank you so much! it is what I figured. I have had the recipe open since this morning on my laptop. I am very tempted. Thank you again. What keeps the peppers from floating to the top of the jar and thus not being covered by the oil? Packing the peppers in there tightly should keep them from floating! Do you think we shouldn’t wash the peppers to keep pepper juice? Some bloggers said that is the secret to really, really good roasted peppers. If I freeze the peppers and their oil, how do I thaw them? In the refrigerator? Once thawed, how long can I keep them in the fridge? How long does the oil last? Does the olive oil solidify in the fridge? The roasted red peppers taste great in a sandwich but the olive oil congeals. I was told that using canola or vegetable oil this would not happen. Olive oil DOES indeed congeal. You could sub in another oil if you prefer for that not to happen. 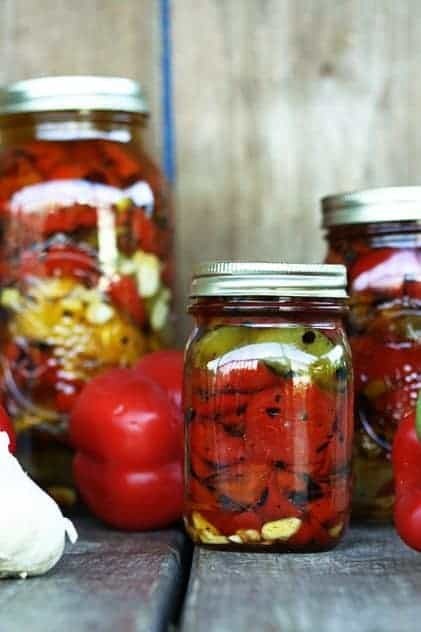 My mother used to can many jars of roasted peppers but they were always in just oil and not in olive oil. We would. Have these for many months I to the winter. Would anyone know how tis was done. I know I helped her but that was over 50 years ago and not knowing that some day I wanted to do the same. Help. And not use vinegar. Did you find a recipe? This is what I want to do also! Hi Joan- Thanks for asking! Unfortunately, with the knowledge we have gained about food safety in the past decade and beyond, we now know that this is not considered safe practice in food preservation. I don’t recommend doing this in oil, but there are safe ways to do it with vinegar. I know you specifically asked to avoid vinegar, but unfortunately that’s the safest way to do the job. The vinegar lowers the ph which makes it more acidic, thereby making it safer for long term storage. Someone in an earlier comment asked about why you hated the olive oil. You didnt respond to it. It cant be to sterilize… are you doing it for another reason? Sure thing, Donna. You heat the oil for a couple of reasons, one of which -quite importantly in my opinion- is to extract the flavours from the peppers and garlic in the mix. Secondly, bringing the oil to that temperature before pouring over the peppers and garlic does actually help increase shelf life in the refrigerator. why do you need to heat the oil? can you can these ? These are not suitable for canning, unfortunately! Having an abundance of bell peppers I would like to can them as there are far too many for my freezer and fridge. Can I can your recipe using a water bath after I bottle with the hot Olive Oil? Hi Darlene- I’m afraid this is not suitable for water bath canning. The fat is unstable in canning. If you’d like to do a bunch of peppers, you might be better off pickling them and then adding oil before serving. Thank you for taking the time to answer me Rebecca…I guess we will just gobble them up in something else. Thank you for your detailed explanation on how to do this dish, it is a dish i have tried to do years ago with limited success, but after purchasing some Capsicums on special I am going to give it a go your way. Excellent, Maureen! Please let me know how they turn out for you! This is amazing! Like you I always put excess peppers into the freezer, however who can pass up fire-roasted. I cant wait for pepper season this year , and to know I can even freeze this recipe is wonderful. Look out peppers, here I come.